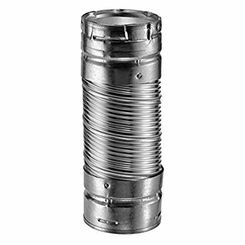 If you are in the market for type B-vent pipe, then you are in the right place. PlumbersStock carries all the HVAC piping you need to get your home heating and cooling in proper order. Choose from a wide variety of discount home improvement solutions. 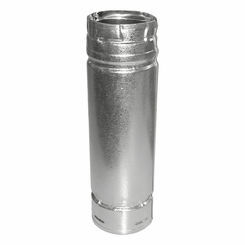 We are almost certain to have the size of B-vent pipe you need at a price you will love. Use the following as a guide to make your purchase if you are inexperienced with these products. What Is a Type B-Vent Pipe? 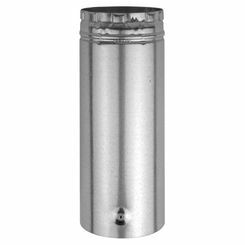 Also known as type B-vent pipe, this HVAC pipe is used for venting any appliances using natural gas or liquid propane with a vent hood attached. 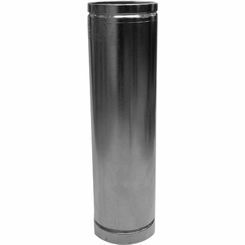 Designed to take a lot of abuse, the B-vent pipe heats up rapidly, staying hot throughout application as to create minimal condensation in the venting system. Though it’s less efficient than most direct venting pipes, it is a space effective option, it’s easy to install, and it’s much less expensive than other similar pipes on the market. All in all, for those looking for a cheap venting option, this is a viable choice, depending on what appliance it is used for. However, you should avoid using this type of ventilation with wood-burning or coal appliances or industrial ovens, as it is not compatible with those appliances. 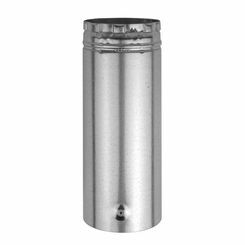 As said before, people looking for a cheap venting option may find the B-vent pipe a perfect choice, particularly for low-profile heating applications. Although price and space certainly make it a worthy choice in the world of venting applications, there are some downsides to choosing such a system; chief among these is the inconvenience of installation and the overall efficiency of the pipe itself. As we have already mentioned, you don’t have to worry about space when using a B-vent pipe; however, all B-vent pipes have to be installed through the interior of the home, terminating above the roof. Even with the pipe’s low cost, the installation may be very costly. On top of this, the B-Vent could be a source of cool air in the living area if downdraft occurs, and the pipe is notoriously inefficient with heat, as some of the heat from the appliance is lost as it travels up the vent. If any of these issues are a problem, there are other options for venting in your home; check out the rest of our venting pipes to see what fits your needs the best. The roof pitch is an important factor. Because the amount of heat the vent gases lose determines the amount of condensation, proper selection—based on these previously mentioned factors—is extremely important to the efficiency and usefulness of your B-vent pipe. For example, the steeper the pitch of the roof, which the pipe is mounted on, the longer your pipe needs to be. Furthermore, the height of the application is important when choosing your pipe, as many do not support certain height applications. Refer to your sale’s representative for more information concerning the specifics of B-Vent height applications and roof pitch data. Thank you for choosing PlumbersStock and if you have any trouble locating the right type B-vent pipe, please contact our customer service team for support. We will help you get on the right track. Enjoy the best prices in HVAC online.